Fig. 1 Principle of the CCM mutation screening technique using labeled target and probe. Target and probe are hybridized to form the heteroduplexes, A-C and G-T (circled). The mismatches are then chemically modified and cleaved. Cleavage products are electrophoresed through a polyacrylamide gel and detected using either fluorescence or autoradiography. L—label, CM—chemical modification. 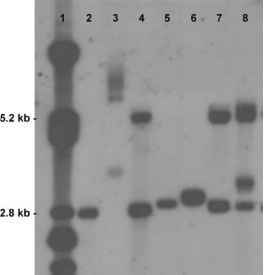 with denaturing Polyacrylamide gel electrophoresis (Fig. 1). Chemical cleavage of mismatch gene-screening protocols can be designed using either patient genomic DNA as the template for PCR or mRNA isolated from specific tissues such as muscle or skin, or ectopic mRNA from peripheral blood lymphocytes. However, when total RNA is used as the template, a nested PCR protocol will probably be required to obtain enough DNA for the CCM procedure. The original CCM studies used DNA probes that had been radioactively end-labeled. This technique was thought to detect nearly 100% of single-base substitutions/17-1 but was considered dangerous because of the use of radioactivity along with toxic chemicals such as osmium tetroxide. However, the introduction of fluorescent-based technology has greatly improved the safety aspect of the procedure. Fluorescent CCM (FCCM), or fluorescence-assisted mismatch analysis (FAMA), has been developed whereby DNA can now be either internally labeled using fluorescently labeled dUTPs, or end-labeled using fluorescently labeled primers, although both procedures will achieve the same sensitivity of detection. Subsequent cleavage product analysis yields precise information on the position of the sequence change from either end of where the mismatch is positioned. A product of 850 bp may yield products of 700 and 150 bp, although the scientist will not know whether the mutation is 150 bp from the 5' end of the fragment or 150 bp from the 3' end. This can be overcome by using a protocol that utilizes different fluorescent labels on the 5' and 3' primers. To obtain 100% sensitivity of mismatch detection it will be necessary for both probe and target to be labeled. Some reports have demonstrated that a number of thymine-guanine mismatches are resistant to modification by osmium tetroxide. However, the complementary DNA strand heteroduplex will consist of an adenine-cytosine mismatch that can be modified by hydroxylamine. The correct formation of the probe/target heteroduplex is essential for chemical modification, although this can be inhibited by the sequence context and/or size of the fragment being studied. Autosomal dominantly inherited disorders will demonstrate a mutation on one chromosome and thus the patients DNA will be heterozygous and can naturally form a heteroduplex. However, autosomal recessively inherited disorders may demonstrate homozy-gosity and will not form a heteroduplex. Here, or where the mode of inheritance is not known, the patient DNA should be mixed with control DNA. Heteroduplex formation is performed by the denaturation of the double-stranded DNA followed by controlled cooling to permit annealing of the target and probe DNA strands.